The Falgun Mela is one the most pious festivals celebrated by the great devotees of Khatu Shyam ji. This Falgun Mela occurs in the month ofFalguna which is generally in the month of Feb or March. It is celebrated 5 days before Holi – The great Indian festival. For the ones who are oblivious to this fact and do not know about Shri Khatu Shyam ji, Here is a brief story. The history of Shri Shyam originates from the Mahabharata. Bhima was a Pandava prince, whose son Ghatotkacha was the father of Barbarika, hence Barbarika was the grandson of Bhima. Owing to the fabulous chivalry and prowess of Barbarika, Krishna did not want him to participate in the great war. As Barbarika got three arrows and he was asked to help the one who is losing, so when Pandavas were losing, he gave help to Pandavas and when Kauravs were losing , he helped Kauravs. Due to this, it was impossible to get the final result of Mahabharata as neither side was losing. Hence Khatu Shyam ji is also known as HAARE KA SAHARA. So, Krishna begged of him his head which Barbarika gave him without any hitch but on the condition that he be allowed to witness the war. Krishna set up his head on a hilltop and also blessed him that he would be deified and worshipped in Kaliyuga like him and that his worshippers shall have their wishes fulfilled. “ Iski Mahima ka varnan karu , Meri Vaani me wohdum nahi . About 975 years ago the wife of Roopsingh Chauhan saw in her dream that deity instructed him to take his image out of the earth. The indicated place, when dug up, yielded the present idol of Shri ShyamJi, which was enshrined in the temple. That spot is now known as Shyam Kund. Lord Shyam Ji- his head is worshipped. The idol is made of rare stone and commands tremendous respect from visitors. Shyam Ji is the family god of lacs of families. 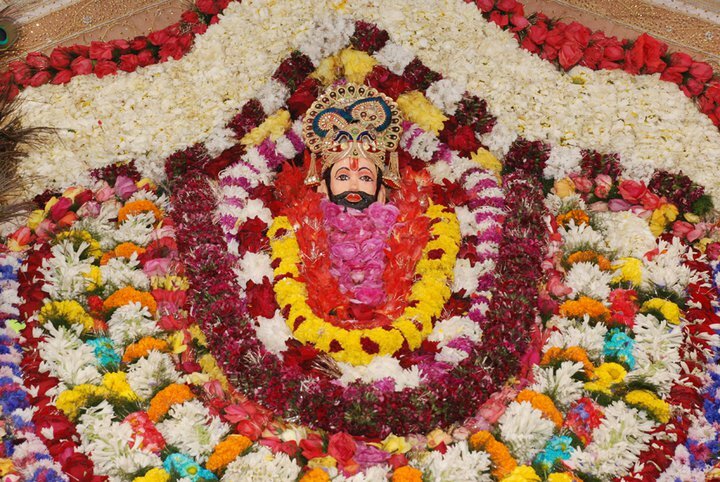 A large number of devotee visit here from across India to take a sight of Baba Shyam Sheesh (Head). Famous singers from across all over the country come here to perform bhajans on this Falgun Mela (Festival). These Days Khatu Dham is a Center of Devotion. Everywhere Shyam brakes Chant Jai Shri Shyam on the Way. It is also called Nishyan Yatra. means a holy journey to khatu shyam ji with shyam baba flags (Nishan). Almost all Devotee of shyam baba starts foot Journey from Ringus to Khatu Dham. Ringus is a town at situated 19 km from khatu Dham. Devotee purchase Nishan and starts their journey to khatu dham. During this 19 km journey, they enjoy full with Chants of shri shyam and bhajan Sandhya . Some Devotee Play with colors Gulal( dry colors) on the way. Many Shyam Bhaktas supply food to pedestrians in the shade of tents. They encourage also to complete their journey with full enthusiasm. They enjoy this occasion as the marriage of Khatushyamji. People enjoy the Falgun mela by purchasing various things. On Dwadashi ( 12th day of the month), Bhog is being prepared as Baba s Prasadi of Kheer, Churama. Special arrangements for security are made to control the crowd. Around 40 Lakh people visit in five days of this holy mela in this small village. To briefly see Baba Shyam s idol, a very tight security is made with the help of bamboo fence around 10 kilometres. Barbarika had obtained a boon from Krishna to the effect that he would be known by Krishna’s own name (Shyam) in the Kaliyuga era (presently ongoing) and worshipped. Krishna had declared that Barbarika’s devotees would be blessed just by pronouncing his name from the bottom of their hearts. Their wishes would be granted and troubles removed if they worship Shyamji (Barbarika) with a true piety. Barbarika: Khatushyamji’s childhood name was Barbarika. His mother and relatives used to call him by this name before the name Khatu Shyam ji was given by Shri Krishna. Sheesh Ke Daani: Literally: “Donor of Head”; As per the legend related above. Haare Ka Sahara: Literally: “Support of the defeated”; Upon his mother’s advise, Barbarika resolved to support whoever has less power and is losing. Hence, he is known by this name. Teen BaaN Dhaari: Literally: “Bearer of three arrows”; Reference is to the three infallible arrows that he received as a boon from God Shiva. These arrows were sufficient to destroy the whole world. The title written below these three arrows is Maam Sevyam Parajitah. Lakha-datari: Literally: “The Munificent Giver”; One who never hesitates to give his devotees whatever they need and ask for. Khatu Naresh: Literally: “The King of Khatu“; One who rules Khatu and the whole universe. Thank you for sharing this complete details about khatu shyam ji and their temple. The devotees of khatu shyamji never knew the complete story behind it. very nice Article. !! Jay Jay Shish ke Daani, Jay Jay Khatu Dhaam ! !